Please review the following information before upgrading to Exit Point Manager 7 from a previous version. Note: For information on upgrading in an HA environment, see Replication of Power Admin, Exit Point Manager, and Central Administration in an HA Environment. Also, the profile PTWEB, used for the old web server, is no longer installed. The Library name for Exit Point Manager is PTNSLIB07. If an alert device is used in conjunction with Exit Point Manager, the alert device may have fields that need to be updated in order to reflect the library name change within Exit Point Manager. The Exit Point Manager 7 web server has been discontinued in favor of the HelpSystems Insite web server and browser interface. Insite offers simultaneous viewing of rules across all systems on your network and support for other HelpSystems products including Robot Schedule and Robot Network. Insite is not installed during Exit Point Manager's installation procedure. To download HelpSystem's Insite, visit the HelpSystems Insite download page. The upgrade process does not copy user profiles to the new authorization lists. You should copy your user profiles to the appropriate new authorization list before using Exit Point Manager 7. If you upgrade from Exit Point Manager 5.3 or 6, the license code is copied to Exit Point Manager 7 when you run the MRGPRVNS command (see Merging Rules from a Previous Version below). If you are upgrading from an earlier version of Exit Point Manager, contact keys@helpsystems.com to request a new license key. If you used the Operations Navigator plug-in in a previous version of Exit Point Manager, Network Security 7 has been modified so that it no longer uses the plug-in. It is Powertech’s goal not to change system values on customer systems because we recognize that security-conscious organizations have rigorous change control processes in place for even small changes to system values. Therefore, we ask you to make any system value changes that are needed. However, the Exit Point Manager installation process could change a system value to allow the install to proceed if a system value is not set as specified below. If the Installation Wizard changes a system value during install, it changes it back to its original value when the install completes. Exit Point Manager 7 installs the following product libraries, profiles, authorization lists, commands, objects, and exit points on your system. To install Powertech Exit Point Manager on your system, the following system values that control object restores must be configured as shown. QALWUSRDMN controls which libraries on the system can contain certain types of user domain objects. You should set the system value to *ALL or include the name of the Exit Point Manager product library (PTNSLIB07 or PTNSLIB and PTPLLIB and QTEMP as a minimum) for the product to function properly. See Allow User Domain Objects (QALWUSRDMN) in the IBM Knowledge Center for more information. Set QALWJOBITP (Allow jobs to be interrupted) to 1. This allows job to be interrupted to run user-defined exit programs. All new jobs that become active will default to be uninterruptible. ShowCase version 9.1.0.3 is required to use Exit Point Manager's ShowCase exit points. Download the Powertech Exit Point Manager installer (setupNetworkSecurity7.exe) from the Exit Point Manager download page. (The "Trial" download is the full product, which can be unlocked with a valid License Key). If you’re only installing the Manuals, the process completes and the installer closes. The Manuals have been installed. You can skip the rest of these steps. If you’re loading the Software for IBM i, continue to step 4. Select or enter the IBM i where you want to load Exit Point Manager. If this is the only installation or update of Exit Point Manager that you're doing, click Finish. Exit Point Manager installs the following product libraries, profiles, authorization lists, commands, objects, and exit points on your system. Enter option 1, Load, next to the Load Name for Exit Point Manager and press Enter. The installation program installs Exit Point Manager, the PTNSLIB07 library (as needed), and three user profiles (PTUSER, PTADMIN, and PTWRKMGTOW). It adds PTNSLIB07 to the system portion of your library list, if required. Review the information on the Install Exit Point Manager Host panel and make any necessary changes and additions. Select *NEW for the installation, then press Enter. The installation program installs Exit Point Manager 7, but does not automatically import information from a previous version. The previous version exit programs remain active, allowing you to continue to use it as you become familiar with version 7 (as long as you do not activate Exit Point Manager 7). 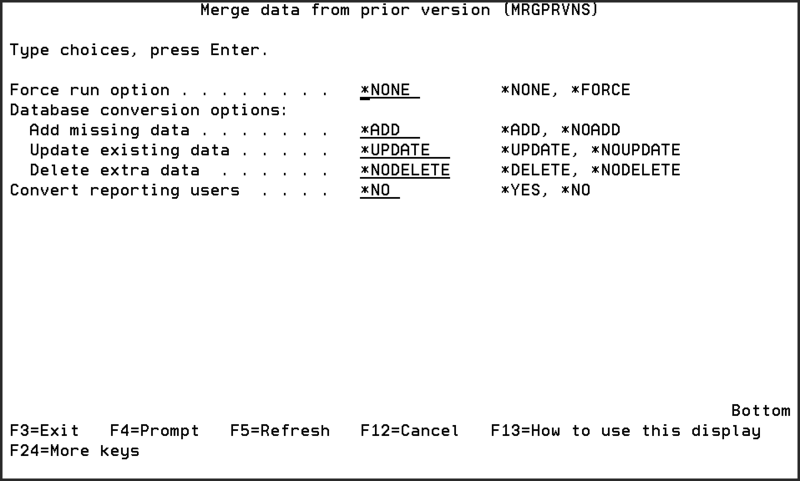 Once you’ve familiarized yourself with Exit Point Manager 7, use the Merge Previous NS (MRGPRVNS) command to merge rules from your previous version to version 7. You should review these rules and make any modifications necessary before activating version 7. Note: Merging data from a previous version of Exit Point Manager does not automatically activate version 7. You must still run the activation process on Exit Point Manager 7 to start using it. See Reactivating Exit Point Manager After an Upgrade (below). Enter the following command on a command line to import rules from a previous version of Exit Point Manager. *NONE Indicates that no special options are specified; the merge process proceeds normally. *FORCE Indicates that the merge process should proceed, even if it has been run previously. Note: Before upgrading, check the PowerTech product download Web page for any additional information. Add missing data Specify *ADD to add data to the new version that is in the prior version but is missing from the new version. Specifying *NOADD will not migrate missing data from the prior version. Update existing data Specify *UPDATE to update data in the new version that exists in the prior version but is different to that in the prior version. Specifying *NOUPDATE will Leave the data in the new version alone. Delete extra data Specify *DELETE to remove data from the new version that does not exist in the prior version. Specifying *NODELETE will leave the data in the new version alone. Reporting-only users were registered as members of a particular Authorization List in prior versions. Newer versions of Network Security employ the internal Product Security functions contained in Central Administration to control access to parts of the software. *NO This value indicates that no users will be transferred from the reporting Authorization List. *YES This value indicates that the members of the reporting Authorization List named in the CVTAUTL() parameter will be attached to the Product Security Role you name on the CVTROLE() parameter. For more details, see Merge Data From Prior Version (MRGPRVNS) in the Exit Point Manager7 Administrator's Guide. The Exit Point Manager 7 web server has been discontinued in favor of the HelpSystems Insite web server and browser interface, which offers simultaneous viewing of rules across all systems on your network and support for other HelpSystems products including Robot Schedule and Robot Network. Insite is not installed during Exit Point Manager's installation procedure. To download HelpSystem's Insite, visit the HelpSystems Insite download page. A feature of HelpSystem's Insite for Exit Point Manager is the Dashboard. The Dashboard displays a count of all transactions monitored or controlled by Exit Point Manager. The Dashboard displays the totals for the servers based upon the criteria selected by the user (today's totals, yesterday's totals, last 7 days or last 30 days). You can also select to see the individual server's counts for the past 24 hours. To activate this feature, start the Dashboard Data Summarization job. PNSHLDDASH - Use this command, Hold Dashboard Collection, to set the system in a state such that data collection to support the web interface Dashboard will not run. PNSRLSDASH - Use this command, Release Dashboard Collection, to release the Hold Dashboard Collection command, allowing data collection to occur. Upgrading and reactivating Exit Point Manager are separate processes. An upgrade installs the new Exit Point Manager software on your IBM i system; reactivation activates the Exit Point Manager exit programs. If you upgrade the software, but do not complete the reactivation process, Exit Point Manager protection and auditing of the new version are not active. However, the auditing and access control of the old version are valid and still in effect unless you previously deactivated the exit programs (removed them from the exit points). When you complete both the upgrade and activation processes, Exit Point Manager actively audits the network interfaces. From the Exit Point Manager Main Menu, select option 81, Configuration Menu. On the Configuration Menu, select option 2, Work with Activation, to display the Work with Activation screen. The Work with Activation screen shows the servers that were activated in the previous version of Exit Point Manager with a Pending Change of *ACTIVATE. Note: Exit Point Manager 7 has been installed into library PTNSLIB07. To activate the servers, press F20, Run activation for an interactive activation request, or F18 for Silent Activation. Reactivation stops and restarts your servers. You can use either the Silent method (performed during an IPL) or the Interactive method to activate the exit programs. Warning: The Interactive method stops and starts your processes and servers when run the activation. You should plan to perform an Interactive activation at a time when stopping critical servers will not interfere with your business processes. If you want to activate additional servers, use the Work with Activation screen to select the servers to be activated. See Activating Powertech Exit Point Manager in the Exit Point Manager Administrator’s Guide for complete information on activation.